Believe it or not, Las Vegas. Anyone who knows me also knows Vegas is not my kind of place. Loud, smoky, too many people, too much crime, etc. But there was a book marketing conference, so off we went. Yes, the Amazing Sleeping Man went too, which is even more surprising than me going there. Fourteen hours of driving, 3 days of conference, one evening on The Strip (Margaritaville, of course), and we were done. I’ll spare you the details on that part. 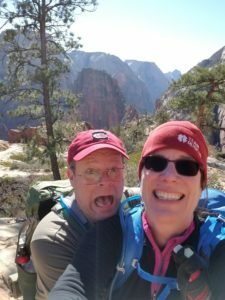 To shorten the drive home a little, we spent a day at Zion National Park. Neither of us had ever been there and the crowds were much lighter with kids are in school. 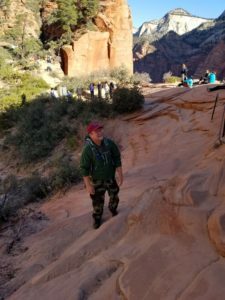 Kolob Canyon was closed, and it was a little cold for the Narrows (hiking in water), so we hiked Angels Landing. Even with the ridiculous number of people on the so-called trail (it’s paved!) it was a wonderful experience. 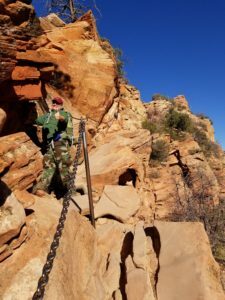 Getting to the very top requires scrambling up rocky slopes with thousand-foot drop-offs on both sides, metal chains making it easier in some of the steeper/more hazardous area. The ASM actually made it part way along the treacherous part and I made it all the way to the top. 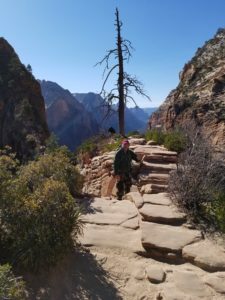 After I returned, we hiked along the West Rim trail for a mile or so. Still lots of people, but not nearly so crowded. 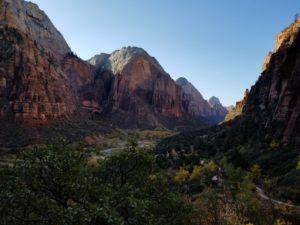 Pictures don’t really do justice to the huge scope of the Zion Canyon. Bye! Have fun storming the Landing! 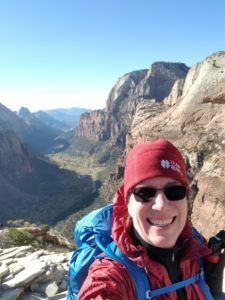 If you go, hike early. 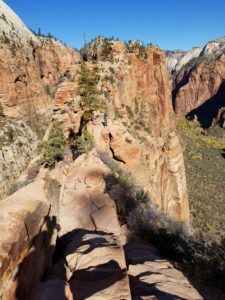 Angels Landing only gets more crowded as the day goes on. “Found us yet, Ruhger?” he asked, ignoring Ruhger’s question.